Dried peppers are a key ingredient in Mexican cuisine. Many traditional celebration’s meals wouldn’t be the same without them, dishes like the Traditional Mole or the Wedding Stew have a sauce base in dried peppers. Many of the dried peppers are mild, and they are used to add flavor and texture to a dish rather than adding hot spiciness to it. Chile peppers, corn and beans form the gastronomic trilogy or foundation of Mexican cuisine. And it is commonly believed that peppers were cultivated even before than corn and beans. But, how do we recognize and select a dried chile that is good for cooking? When you buy dried chiles make sure they are not broken, that they still have their stem and they also look clean from dirt, dust and any small insects. The color should be bright and you should be able to slightly fold them. If the peppers break when you try folding them, it means they are old. During the time the chiles stay in storage they will keep dry. They will change in color and texture, but they won’t lose their flavor. Store whole chiles in plastic bags in your freezer, this way they will keep their texture and color for at least 6 months. Or better yet, make them into a paste roasting the chiles and mixing them with oil, this way they will be handy when you are in a hurry to cook something delicious and authentic. To reduce the hot spiciness of some chiles, remove the veins and seeds. Chiles also lose a little bit of their spiciness when they are soaked. I’m adding the Scoville heat index of each chile pepper based on the book “101 Chillies to try before you die” by Author David Floyd as a reference, but let me tell you, each pepper spiciness also depends on the soil of region where they were harvested. I’m sharing with you a list of 6 of the most popular chiles you will find here in the United States. Nowadays, of course, you can find much more variety of chiles, and I will talk about them in my next post. But for now, these are the ones we consume the most often in our daily cooking. This list is based on my experience from the places I have lived and traveled in this country, plus the many offerings you can now find buying online. 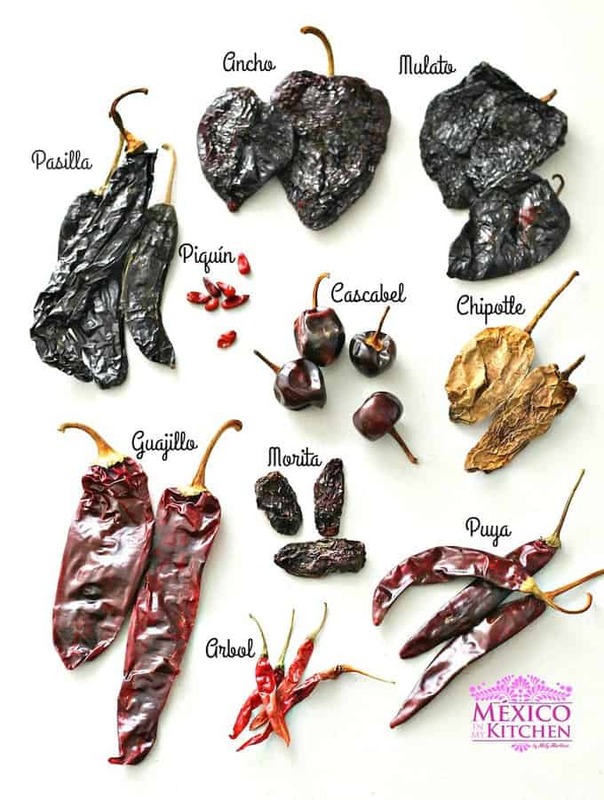 The name of some Chiles changes according to the region, their color, or if they are fresh or dried. When buying Guajillo Peppers, make sure they have a dark color and a thick texture, there are many peppers sold as Guajillo, but their color is ligther and they skin is thin, those peppers are form China and are not the Guajillo Peppers from Mexico. Recipes using Chile Guajillo also include; Easy pork stew, Asado de Boda, Red Enchiladas, Mole de Olla, Red Pozole. Since this well-known chile is used all over in the country, I think it is important to mention that it is called by different names depending on the region of the country. Here are some of the names: Chile Color, Chile Colorado, Chile Ancho Chino, Chile Pasilla Rojo. It is a key ingredient in adobos, moles, and sauces for enchiladas and salsas. This chile measures about 4 to 5-1/2 inches in length, and about 2-3 inches wide. When is fresh, it’s a Chile Poblano that once it matures it changes to a red color. To dry them, the fresh chile poblanos are left on the plant until they are mature and had a red color. After that, they are sun-dried. The skin texture of this pepper is a bright-corrugated soft skin, and it has a dark red color. It is also a very mild chile with a fruity flavor. 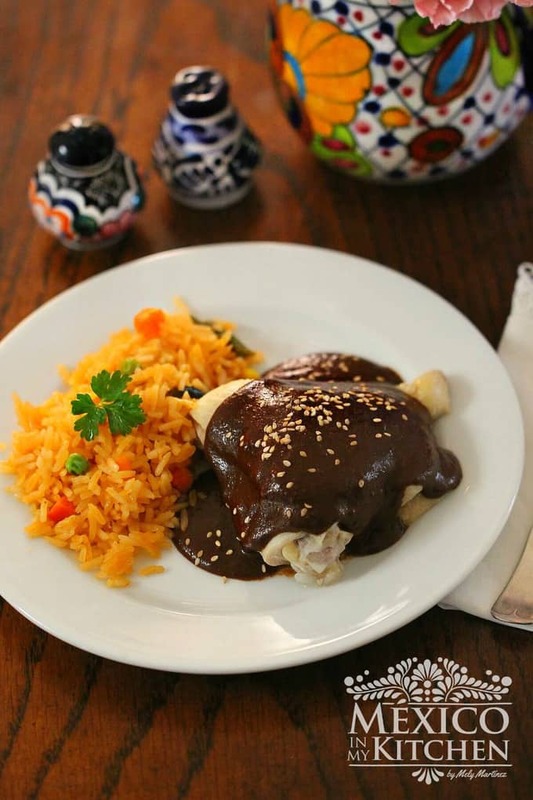 Recipes using Chile Ancho: Mole Poblano, Asado de Boda or Wedding Stew, Adobo Sauce, Red Enchiladas, just to mention a few. This is also a Chile Poblano when fresh, but it has a darker color. When it dries, the color is almost like a deep reddish brown, very close to a chocolate color. The difference between Chile Ancho and Chile Mulato comes from a pair of distinctive genes that makes them ripen in a special color. Sometimes, if you get confused between Chile Ancho and Chile Mulato, just place the two of them together and the one that has a darker color is a Chile Mulato. 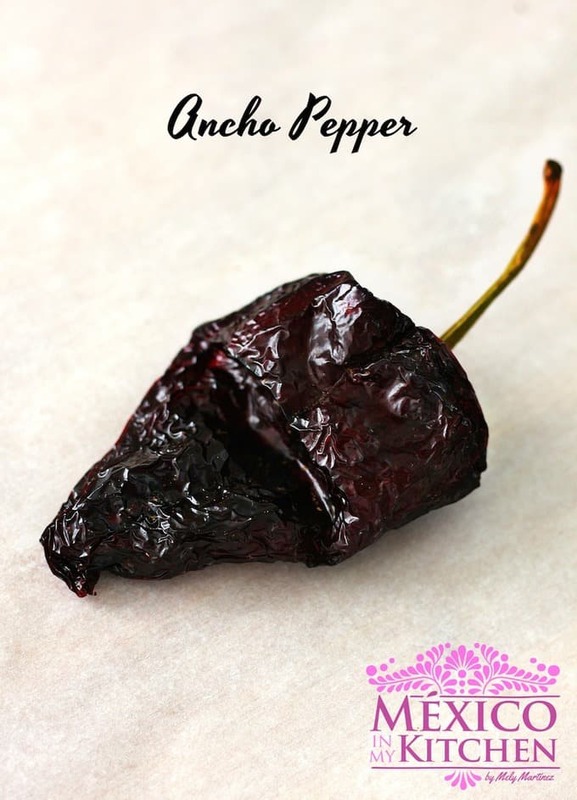 Its skin has the same characteristics as an Ancho pepper, and the same dimensions. Uses for this pepper are, Moles, stews, and salsa. It has a slightly sweeter – chocolate flavor. 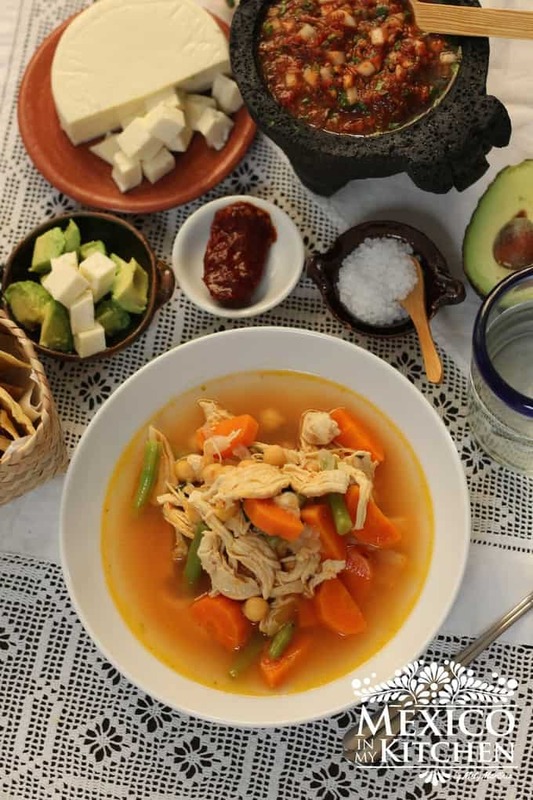 RECIPES using Chile Mulato, Mole Poblano, Mole de olla, stews. Chile Chipotle (also knows as Meco), which name comes from the Náhuatl word chilpoctli, which means “smoked pepper,” is a chile jalapeño that has to ripen to a red color on the plant then harvested and dried and smoked to achieve that color and flavor. Nowadays, most of the process is done by industrial drying machines, but there are still a few regional small producers that smoke and dry the peppers using old-fashioned methods with Guava and Oakwood. Depending on the smoking method, and the humidity on the environment, the Chipotle chiles can take from one week up to a month to dry. Their size varies but the average Chipotle Chile is 3” long with a light dusty brown color and a wrinkled skin. Chiles Chipotle are very popular, especially the ones sold in a canned version with an adobo sauce, they are used in salsas, and to add flavor and spiciness to stews like this “Chipotle Meatball” or this easy dish of “Chicken with Creamy Chipotle Sauce”. This is a spicy, long skinny pepper, with thin and bright red skin. They measure between 2 – 3 inches long and ¼ inch width. They are used to add heat to table sauces and stews. Like the famous “Salsa Taquera” here in the United States. Seeds and veins are not usually removed from these peppers when you cook them. Make sure to buy the peppers that had the stem, that they are fluffy and not flat, and the skin is a little thicker. The ones sold without the stem are from Chinese or even India, a very different pepper than the Mexican Arbol Pepper. You can find many salsa recipes here in the blog using chile árbol like this. These are very hot small peppers, also known as “bird peppers’ with an elongated shape, it measures about ¼” long and 1/8” width. There are several small types of hot chiles (some are a cylindrical shape too) that are called indistinctly “piquín” when they are dried but when they are fresh they receive other names according to their shape and the region where they are grown. Like the Chile Tepin that is very similar but is round. Piquin pepper is a very common chile on the northern state of Nuevo León, México and also found here in the USA Southern States of Texas, Arizona & Nuevo México. You can find other varieties of these Chiles in the south of México and other central and south America countries. Other peppers in the country similar in size and form to piquin peppers are; chilpaya, tepin, timpinchile, totochile, quimiche, chile de monte, Chile bolita, chile canica, piquin de Coahuila, and others that change by region. The above picture represents the one that you can find here in the States as Piquin Pepper, and this one is a mix between a Totochile or a Timpinchile. They are typically used for salsas, like this Piquín Salsa. If you had never cooked a meal with dried peppers, make sure to use plastic gloves to avoid skin irritability when cleaning the peppers and removing the seeds and veins, better safe than sorry. If you don’t use gloves, as many of us do, but still feel a little burning sensation in your hands or fingers, dip them in cold milk to sooth the feeling. Milk also helps to reduce the burning sensation if your food is too spicy for your taste, drink a little milk and the sensation will go away. I’ll post about the rest of the peppers in the top picture in the coming days. I hope you enjoy this information and feel confident to start cooking with dried peppers using the many recipes on the blog. Types of chili’s used for tamales. The sauce that many tamales use is a combination of Guajillo & Ancho peppers. But you can also find tamales that use only one of those peppers. Some tamales will have a sauce that includes chipotle peppers. Each region in Mexico has a unique way of making their tamales. Please let me know if you are looking for a particular type of tamal sauce. Where would you recommend I buy these online? I use to buy them from Amazon when I live in the north and could find there in my area. Thankyou Mely for the details of chiles. I actually have all but a couple of them because I buy them when I go to Puerto Vallarta for my vacation and stuff them in my suitcase so I can create authentic dishes like yours here in Canada. Chiles are on my list again this year! DID you forget a write up on the Chile Cascabel? It’s in the group picture but does not have an individual write up. If you read the whole post, it says that I’ll be posting the rest of the pepper’s information later on. 🙂 And, as a matter of fact, it will be published today. Stay tuned! Why are some tamales wrapped in paper? What is this paper and why is it used ? Where can u buy it? I had seen those tamales wrapped in paper, I think that people use them because they can find corn husks and it is a good an alternative wrapping. You can use parchment paper or aluminum foil. I found it is sold at latin stores. My dried chile ancho is whitish in the inside. Is this harmful? It seems like it could have some kind of insect or mold growing in there. Not sure how bad is it until I see a picture. If you remove the infected part you can use the rest of it.